The game of cricket has been witness to some of the strongest on-field friendships, and some epic rivalries as well. Over the years, viewers of the game have been treated to some monumental rivalries. Brian Lara’s batting exploits against Muttiah Muralitharan have now become an integral part of the cricketing folklore. The same happens to be the case with Jeff Thomson and Sir Viv Richards. The Aussie quick Jeff Thomson was known for tormenting batters around the globe but found an able opponent in Sir Vivian Richards, a batsman who could smash the bowlers all around the park with relative ease. But for an Indian cricket fan, the book of famous cricketing rivalries would always begin with the Tendulkar-Warne saga. A lot of you would agree that not even retirement could end this rivalry when Sachin Tendulkar was seen facing Shane Warne in an All-stars clash in the United States back in 2015. Cricket pundits would agree that it was a rivalry of epic proportions. Warne, despite being the world’s best leggie at the time, had a torrid time bowling to the batting genius. The Aussie fans reading this post might disagree, but no batsman in world cricket enjoyed facing Shane Warne as much as Sachin Tendulkar did. Aussie fans would be disappointed to know that spin wizard from Australia could only dismiss Sachin a mere 4 times in as many as 29 encounters. It comes as a bit of an anti-climax that one of the world’s biggest cricketing rivalries had a rather humble beginning. Not many would be able to recall Australia’s tour of India in 1997-98. It all began during the first Test match of the series. The Indians, after being bundled out for a paltry first-innings total of 257, fought their way back into the game. The Aussies, despite making a promising start, could only manage a paltry lead of 71 runs. The Indians, in their second essay, looked much more confident and ended up declaring at 418/4. Sachin Tendulkar’s swashbuckling knock of 155 was the highlight of the second essay. The innings is remembered for Sachin’s dominating batting display against Warne. While all other Indian batters found it difficult to come to terms with Warne’s artistry, Sachin was seen feasting on Warne’s googlies. A striking feature of Tendulkar’s innings was the assurance with which he faced Shane Warne. It was, as they say in English, a clear case of fire meeting fire. The rest, as they say, is history. While Shane Warne conquered the rest of the world with his majestic bowling displays, he could never really find chinks in Tendulkar’s armour. The assurance and skill with which Sachin faced Shane Warne turned the battle into a life-death situation for both the teams. 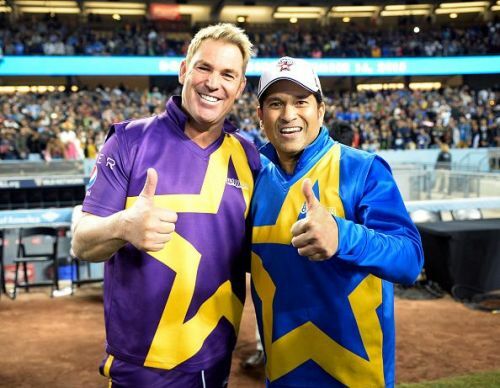 Sachin had a great time facing Warne in coloured clothing too. As far as the numbers are concerned, Sachin averaged exactly a 100.0 against Shane Warne in ODI cricket. Wow, those are staggering numbers, aren’t they? A talk regarding Sachin’s One-Day exploits against Shane Warne would certainly be deemed incomplete without mentioning the onslaught carried out in two successive innings at Sharjah. The fans kept cheering as Tendulkar kept smashing Warne to all parts of the ground on his way to an epic 143. The innings saw the master cutting loose and helping India qualify for the final, but the best was yet to unfold. Another herculean effort from Sachin a couple of days later saw Shane Warne running for cover. Chasing 273 for an unlikely victory, the Indians won the match and the trophy riding on Sachin Tendulkar’s imperious 134. An innings that saw an over-excited Geoff Boycott, who was commentating during the match, speaking volumes about Tendulkar’s majestic batting displays. No one can forget a worn-out Shane Warne staring his way into the depths of the oblivion after the match got over. He looked exhausted because of the match, but even more so because of the hammering, he had received. Warne, in one of his blogs for the English daily, The Telegraph agreed that bowling to Sachin Tendulkar was tough. He further states that Sachin was his “greatest opponent”. The rivalry between the two greats grew with each passing encounter, but it wasn’t Sachin’s stronghold over Warne that defined this epic rivalry. The rivalry was marked by the fact that the two of the greatest players of their generation came face to face and gave fans some of the finest cricketing memories that’d be cherished for years to come.